In my vain attempt to get my Christmas cards made in time to post, I've used the sketch to add to the pile. This is more NBUS and was stamped using various inks to add interest. What is hard to see in the photo, is that I stamped the single berry several times in silver Delicata ink which gives a lovely shimmer the camera didn't pick up. 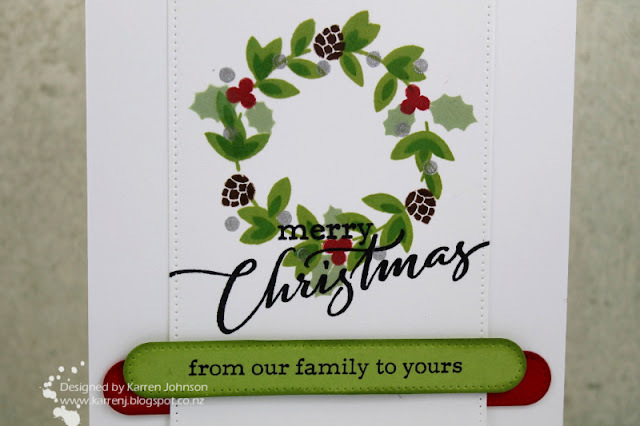 I stamped the sentiment across the wreath then the rest of the sentiment was stamped onto a strip of Green Apple cardstock that I run through a Blueprints die and also lightly sponged the edges of. I did the same with the red layer underneath. Thanks for visiting! The rest of the Design Team have created some gorgeous cards with the sketch so be sure to check them out. Gorgeous wreath! The layering of the greens is so pretty. what a lovely take on the sketch, karren... love the pretty wreath! This is just glorious, Karren! I'm loving those blueprint dies; awesome shapes, and love the stitched detail. I can see the silver shimmer in the berries ... all of your stamping is just stunning. gorgeous card mf...love the fresh, clean look of it! Beautifully stamped! Love this sweet wreath! I'm in love with the colors you've used, Karren - these are the greyed-down hues I love so much! Gorgeous design, loveliest card! Pretty wreath. And I can definitely picture the sparkly berries! Love how you stamped the bold sentiment across the wreath. I love the green and red strips staggered with the wreath panel in between, so effective. The wreath is so beautifully stamped. Absolutely gorgeous! Your wreath is stunning and really pops off the white on white card stock! The wreath is so luscious, vibrant & modern, & really pops off the white layers. Great addition to your Christmas stash, Karren. 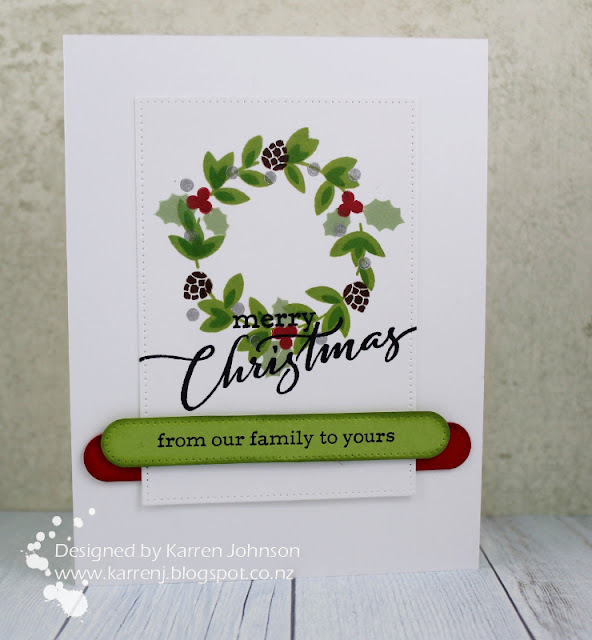 Absolutely GORGEOUS wreath, Karren! I love how you stamped all of the images, especially that you chose Silver Delicata for the single berries! I also love your choice for the sentiment, and how you cleverly placed the red banner behind your focal panel...so elegant!